Joanne's Blog: TJ Maxx, Winners and Homesense..... how could my "favs" do this to me??? TJ Maxx, Winners and Homesense..... how could my "favs" do this to me??? 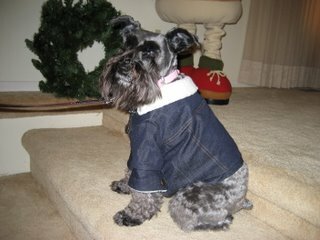 This is Heidi, our miniature shnauzer, wearing a lovely coat, which was a gift from my friend Donna. Donna's a shopping guru, very savvy.... maybe this very jacket put her in harm's way.... what to do, what to do??? ?